“TOKYO, July 31, 1894—’For the foreseeable future,’ declares an American defense expert, ‘no rational Japanese naval planner could present a plan to defeat the Chinese navy, even in the Yellow Sea.’ Why say such a thing? Because it stands to reason. Japan has been a modern industrial nation only since the Meiji Restoration of 1868-1869. That’s under three decades. “And after centuries of self-imposed seclusion, Japan has no seafaring tradition to speak of. Its navy? Posh. The Imperial Japanese Navy got its start as an ironclad fleet only 25 years ago, when it took custody of the French-built ram Stonewall. CSS Stonewall was a hand-me-down from that notable naval power, the Confederate States of America. “TOKYO, April 17, 1895—Today the Chinese and Japanese imperial governments signed the Treaty of Shimonoseki, ending the limited war that broke out last August. Under the treaty’s terms the Qing government relinquishes its suzerainty over Korea, cedes Formosa, the Penghu Islands group, and the Liaotung Peninsula to Japan, and opens new treaty ports to Japan on a most-favored-nation basis. “But the treaty’s impact goes well beyond that. Foreign commentators see Shimonoseki as signifying Japan’s arrival as Asia’s preeminent power. This limited war, in short, transformed the regional order. The foregoing is fictionalized news analysis, but it captures the state of expert opinion about the military balance on the eve of the Sino-Japanese War of 1894-1895, and at the peace settlement that followed. Few observers thought Japan’s navy could win, and they gave good reasons for reaching such a verdict. They also happened to be wrong. History abounds with such failures. The opening quotation from an unnamed military expert is a slight twist on Kennedy School professor (and former Pentagon official) Graham Allison’s recent claim that the U.S. military is and will remain unbeatable in Asia—even on China’s home turf—into the indefinite future. Only the irrational could think otherwise, saith Allison. Yes, you read that right. Herewith, three lessons from 1895 that suggest otherwise. Human beings design hardware, and the tradeoffs they make at the drawing board can have colossal import. Look at it this way. The three basic attributes of any warship are speed, protection and armament. If shipbuilders want a lot of one attribute, they typically end up sacrificing along one or both of the other axes. A heavy missile loadout, for instance, adds weight to a hull. Weight slows down the ship, requiring designers to compensate by subtracting armor, adding bigger, more expensive engines, or both. Slow, stoutly armored, and heavily armed, or fleet-of-foot with lighter or fewer weapons? Navies invariably strike such compromises. There’s no free lunch in naval architecture. Take a modern example, the U.S. Navy’s Littoral Combat Ship. The founders of the LCS project mandated a whole lot of sprint speed. That meant not just sporty engines but lightweight construction and limited armament. Indeed, one of the LCS classes is built entirely of aluminum, not the sturdiest material for withstanding battle damage. If speed is all-important, you give up protection and weaponry. All ship designs involve choices. Seafarers may not discover the repercussions of those choices until they’re in the thick of combat. Now flash back to fin de siècle Asia again. Like many navalists of the day, Chinese naval officials and their foreign advisers saw battleships as the coin of the realm. They prized thick armor—protection—over speed and firepower. China’s German-built battlewagons boasted heavier guns than IJN men-of-war, but with a slower rate of fire. And because of their steep cost, there were only two of them in the Beiyang Fleet, the formation that fought at the Yalu. Japanese designers, by contrast, rated speed, maneuverability and rapid-fire gunnery above protection and major-caliber guns. Battle revealed that Qing designers had chosen poorly. Quick-firing Japanese guns delivered heavy aggregate weight of shot against the Beiyang Fleet, even though each individual projectile carried less destructive power. Lighter Qing vessels proved susceptible to Japanese gunfire, even though the two rugged battlewagons largely shrugged off punishment. Beiyang Fleet commanders lost two-thirds of their force at the Yalu. That’s what you call decisive. Are we really prepared to say the People’s Liberation Army (PLA)—an upstart force like the IJN of 1894—cannot pull off a similar feat? Have Chinese ship designers made uniformly bad choices? Is the thicket of anti-access defenses the PLA has strewn along the mainland coast over the past two decades a sham? China’s military has a habit of defying judgments of its battle capacity. Virtually every platform unveiled over the past decade—guided-missile destroyers, high-tech diesel subs, an aircraft carrier—has taken Western China-watchers by surprise. So let’s not succumb to hubris. We all know what follows hubris. As things turned out, then, IJN officials outthought their opponents in fleet design. 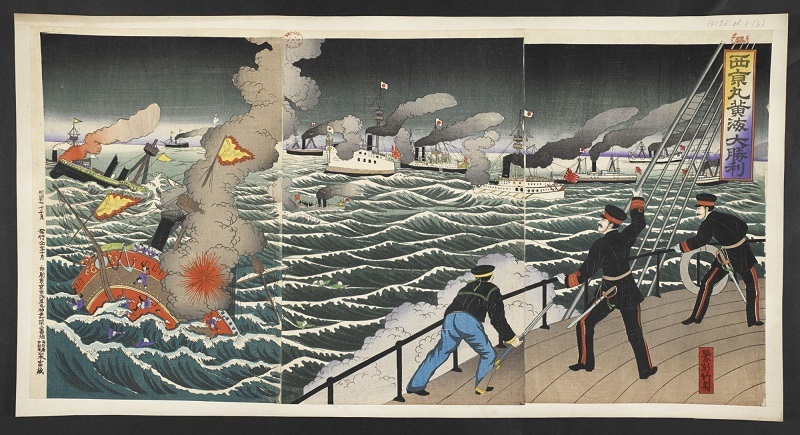 Japanese mariners also outmatched their antagonists in seamanship, gunnery, and martial élan. Boasting superior weaponry biases probabilities in favor of the side holding it, to be sure. But when you come down to it, people, not machines, fight wars; and they use their minds. The lesser combatant can give a good account of itself—perhaps good enough to carry the day. It worked for Tokyo. If it’s possible for the weaker contender to play a weak hand wisely, it’s also possible for the strong to play a strong hand foolishly. You can misuse a formidable military, squandering your advantages in part or in full. The strong tend toward complacency. When you’re top dog, why try harder? Or, big powers have a bad habit of taking on commitments willy-nilly—commitments that demand forces and policy energy. The weak have the luxury of concentrating on one thing a time—indeed, they can do little else—whereas the strong scatter their strength across the map. The weak thus have a chance to turn the world upside down, making themselves stronger than enemy forces at the decisive place and time. Such factors help explain why Qing naval commanders were reluctant to mass their entire fleet to overmatch Japan’s Combined Fleet. China has a long, distended periphery to manage, whereas Japan focused tightly on the Yellow Sea basin—on Korea, and on the Liaotung Peninsula, which overshadows sea access to China’s capital city. Those who hold forth authoritatively about human conflict are apt to disappoint. The only thing wise men profess with sublime confidence is how little they know. Analysts traffic in complexity and uncertainty, a realm of human interaction ruled by mercurial and indeed “paradoxical” logic. Reversals and re-reversals of fortune are commonplace in that graveyard of military prognoses. And this is a realm where knowing the foe is harder than strategists like Sun Tzu allow. Foreign militaries resemble “black boxes” in peacetime. That is, outsiders know what they look like outwardly. They can tabulate lists of ranges, payloads, and other technical specifications, and venture informed guesswork about combat performance. But only in wartime does hardware perform up to its potential—or not. Nor is foreseeing how foreign officers and enlisted will execute their duties amid the din of combat a straightforward proposition. To borrow from Carl von Clausewitz, armed conflict is a trial of resolve and arms waged through the medium of the latter—i.e., through the medium of physical force. Many are the instances in history when the weaker contender prevailed. That’s because one side typically wants its goals more than the other. Political leaders balk at hazarding the nation’s entire military in an all-out slugfest unless their political aims command surpassing value. Risking it all raises the possibility of losing it all—and exposing the nation to worse things in the future. Better to conserve resources, hedging against the unknown. The strong, consequently, may pull their punches for political reasons. Clausewitz observes that a weaker combatant need not win an outright military triumph to win politically—the only kind of winning that matters. It can dishearten a muscle-bound adversary, or drive up the costs of victory so high that the adversary concludes it can’t win at an acceptable price. Relative apathy bestows opportunity on weaker but resolute antagonists. So to rifle through the pages of Jane’s Fighting Ships, project the victor in a naval clash, and pronounce other possibilities irrational is to rule out human ingenuity, human fallibility and the vagaries of war. Worse, it rules out politics. Japan only needed a small-scale triumph over imperial China to fulfill its aims in 1894-1895. It saw no need to overthrow the Qing regime, occupy China or even vanquish the entire Qing navy. Today, likewise, China need not utterly defeat American arms to achieve modest goals. Capability sufficient to Beijing’s purposes may soon fall within the PLA’s grasp. Heck, it may already be within reach. Take your prophecies, with a pinch of salt.